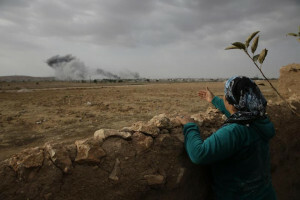 Turkey, a NATO member since 1952, has played a pivotal role in the destabilization and destruction of neighboring Syria. Since 2011, Turkey has allowed its territory to be used as a transit and staging point for sectarian terrorists flowing from around the world and into Syria in what could be described as a defacto NATO invasion by proxy. Clearly, ISIS is the verbatim fulfillment of Hersh’s 2007 warning. And while some may question what took place between 2007 and the current disposition of ISIS today, those documenting the ongoing conflict in Syria starting in 2011 have noted substantial and continued state sponsorship of militants fighting in the Syrian conflict, many of which are now confirmed to be operating under the banner of ISIS. Headlines over the past 3-4 years including, “C.I.A. Said to Aid in Steering Arms to Syrian Opposition,” “First Syria rebels armed and trained by CIA ‘on way to battlefield’,” “Arms Airlift to Syria Rebels Expands, With Aid From C.I.A.,” and “Official says CIA-funded weapons have begun to reach Syrian rebels; rebels deny receipt,” reveal ongoing Western support, bridging the gap between the conspiracy exposed by Hersh in 2007 and the current torrent of supplies flowing to ISIS via NATO territory. It is clear that the ISIS threat was NATO all along, the culmination of a conspiracy spanning at least two US Presidential administrations, and resulting in a regional conflict marked by some of the most horrific barbarism documented in modern history. With NATO feeding the ISIS threat directly, no serious attempt to destroy ISIS in either Syria or Iraq can be attempted without first cutting its supply lines leading from NATO territory. Clearly the United States, NATO, or regional partners like Israel, Qatar, or Saudi Arabia have any intention of doing so. As indicated by DW’s report, Kurds operating on both sides of the Turkish-Syrian border are attempting to seal off the flow of supplies leading from NATO territory. The Syrian Arab Army, the Iranian forces supporting anti-ISIS fighters in Syrian territory, and the allies of both countries must insist that strict resolutions are passed to secure the border and stem the flow of ISIS’ lifeline. A clearly worded resolution, if voted down by the likes of the US and its NATO accomplices, will expose further the true nature ISIS and the misanthropic agenda of the West it is a manifestation of. If the West capitulates and the resolution is passed, further steps toward arming and aiding the Syrian and Iranian governments and their various allies in the securing of the Turkish-Syrian border can be made. From there, the proxy war engineered and executed by the West which has engulfed the region for years, may finally be brought to an end.